People got burned walking across hot coals, you say? There’s a shocker. But the Dallas seminar had over 7000 participants, most of whom completed the fire walking ceremony without injury. Why did most of those people walk across the coals safely while a (relative) handful got burned? The Robbins camp might say they just didn’t believe in themselves enough to fully unleash the power within, but it actually has everything to do with physics. As I wrote back in 2012, it is quite possible to firewalk safely. A physics professor at the University of Pittsburgh named David Willey does it all the time, thanks to his grasp of the underlying physics. This is well-established science. The key factors at play are the low thermal conductivity of the burning wood-turned-to-coal, an insulating layer of ash, and the short time of contact between the hot coals and the soles of the feet. In particular, the coals must burn down to around 1000 degrees Fahrenheit, preferably with a thin layer of ash providing extra insulation. This also burns off excess water, which increases the heat capacity and thermal conductivity of the coals. 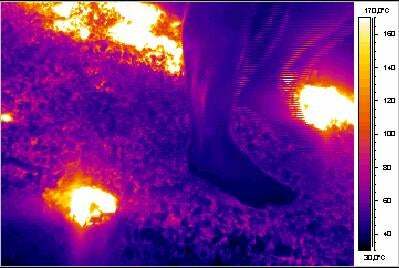 Back in 1998, Willey and Kjetil Kjernsmo of University of Oslo developed a computer model of a fire walker’s foot, and then compared it to infrared imagery of people fire walking in Seattle. Those images showed that the foot really does remain cool when the stunt is done correctly. So what went wrong in Dallas? Probably the same thing that happened at the 2012 San Jose seminar. You have to set up a scientific experiment correctly to get the best results, and for something like fire walking there’s not much margin for error. Those who got burned probably lingered just a bit too long on the hot coals, the better to, say, snap a selfie of their moment of enlightenment.